Ed Wendell, a WRBA director, says that leaving mailbox graffiti unattended tells vandals they can paint around the area. This Woodhaven resident’s fence was vandalized just a block away from a tagged mailbox. Graffiti vandalism has been a significant problem in Woodhaven this year, civic leaders said. 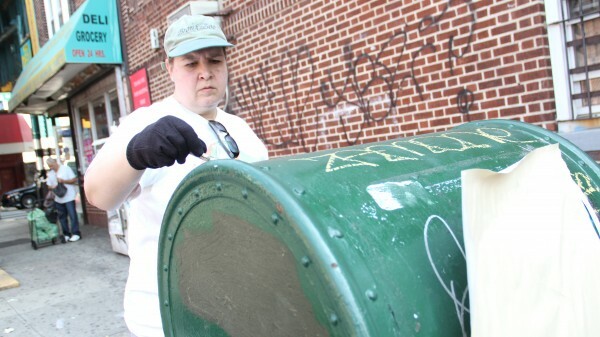 Light volunteer numbers and a harsh winter both made it hard for the neighborhood’s own Woodhaven Residents’ Block Association to paint over all the swirling tags on mailboxes. But that did not deter Martin Colberg, president of the WRBA, from going out with volunteers Sunday to clean up any tags that might be found on the more than 100 mailboxes in the community. With just four volunteers, one group in a car and another on foot with paint buckets in hand, the group came close to cleaning up virtually all the tagged mailboxes in Woodhaven. Colberg said that while some graffiti vandals often come back and tag the same mailboxes regardless of them being cleaned up, constant supervision and undoing of their graffiti work might ultimately silence them. Ed Wendell, one of the WRBA directors, also said that if graffiti vandals do come back to tag the mailboxes again, it only increases the likeliness of them being caught by the police. Wendell also said that some graffiti has been welcomed by the community because the store owners in the area have given some artists permission. What is not welcomed, he said, is graffiti vandalism, or work done without permission that ultimately costs the city money. The civic leader said about $20,000 has been spent by the area’s City Councilman Eric Ulrich (R-Ozone Park) on an annual basis r to clean up graffiti that could be given to something else like senior centers, school programs, or other programs. Ulrich announced his securing of funding last month to help revitalize parts of Woodhaven, including Jamaica Avenue, with a graffiti removal program and other amenities. In the coming months, the councilman said the Queens Economic Development Corporation would be working to revitalize an anti-graffiti initiative the residents of Woodhaven once enjoyed before it slowly faded away over the last year. Ulrich also said he secured money to bring new street lights along Jamaica Avenue and also install new high-end litter baskets for the area. The WRBA will do one last clean up this summer and welcomes any more volunteers, Colberg said. They have a little more than 20 mailboxes to check and possibly paint over until they are done, the group said.